All kinds of awesomeness for everyone! ‘How I met your mother’ is still one hell of an awesome show. 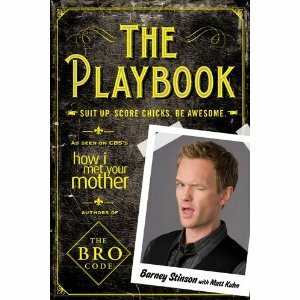 With The Playbook, you can follow Barney Stinson’s footsteps. It came out in october 2010 and has 141 pages of instant awesomeness. After reading The Playbook, you will be able to ‘hunt’ any beautifull woman in the world, discover her passions and last but definitely not least: trick her into sleeping with you. You’ll turn into a real ladies’man in no time with these 75+ seduction techniques developed by the master himself! You can buy this book at almost every shop (like Amazon, bol,…). This will be the ultimate new year’s gift for all the ‘How I met your mother’ fans!